Colonel Tom Devers leads a mission to Mars with three other astronauts to acquire an object that appears to be anything but natural. Upon loading the object onto their ship and spending some time figuring out what it is, the four men are witness to the holographic record of an alien civilization. One hundred seventy-five years before the record was made, fifteen billion people died in a global war on the planet Plixon. The World Peace Council (WPC) then implemented a single world government and developed the Program to ensure that peace would forever reign and the people of Plixon would never again be subject to the horrors of war. 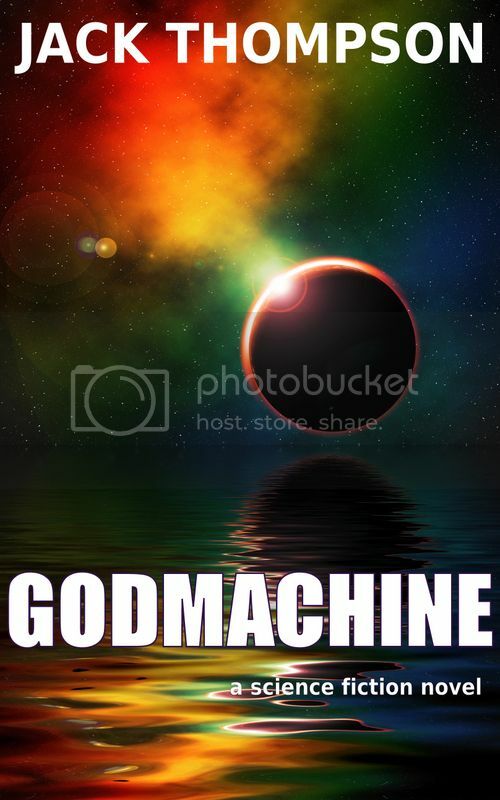 The Program was run by a highly advanced computer called the Godmachine. Its purpose was to inform the citizenry how to live in peace and harmony through total control of every action and behavior. Ra'dall Simms, one of Plixon's citizens, lives a quiet life (as does everyone on Plixon) cataloging data for the Godmachine to use in its predictions (directives) for optimum outcome. Ra'dall discovers an anomaly within the crime data in the capital city of Galanta, dutifully reports his findings to his boss, and is summarily sent in for re-alignment. After Ra'dall's "treatment", he is allowed to go back to work (minus a few memories) and continue on with his life. But one kiss from his lover brings his memories back and thrusts him into a course of action that will lead to either the greatest adventure of his life or his death at the hands of government officials. Ra'dall must find a way to stop the Godmachine before its seemingly innocuous Program causes irreparable damage to the very existence of the people of Plixon. Godmachine is a thoroughly entertaining story about a dystopian society similar to 1984, though not as dark. Mr. Thompson writes in a way that allows for a wonderful ease of reading, while his captivating dialogue propels the tale along nicely. Mr. Thompson clearly understands the nature of freedom and government. His novel explores the ideology that insists the only way to have a utopian society is through total and complete control of its citizens. But this begs the question: Who watches the watchers? Any "utopian" society must surely be run by someone, something, or typically a group of elite, who of course are not subject to the rules imposed on the rest of society. Yes, that is the actual logo of DARPA's Information Awareness Office! As Rahm Emanual said: "You never want a serious crisis to go to waste. And what I mean by that is an opportunity to do things you think you could not do before." *I thought this was a fitting Public Service Announcement/citizen motto: "Don't think. Obey." *There is a great passage showing the arrogance of the elite council members arguing with their beloved Godmachine. *Another aspect of this novel is the massive monitoring of citizens through tracking devices and cameras everywhere, something that is becoming a frightening reality in the world today.